- The Attorney General of the Federation and Minister of Justice, Mr. Abubakar Malami, SAN, has challenged the powers of the National Industrial Court, NIC, in Abuja, to stop the suspended Chief Justice of Nigeria, CJN, Justice Walter Onnoghen, from facing trial over his alleged failure to declare his assets. The AGF, maintained that the NIC lacked the jurisdiction to interfere in the ingoing criminal proceeding the Federal Government initiated against Justice Onnoghen before the Code of Conduct Tribunal, CCT. He therefore raised a preliminary objection to challenge a suit the NJC relied upon to order the Mr. Danladi Umar-led CCT panel to halt action on the planned arraignment of the suspended CJN. It will be recalled that the NJC had on January 14, ordered the federal government not to proceed with Justice Onnoghen’s trial, pending the hearing and determination of the suit that was lodged before it by a rights activist, Mr Peter Abang. 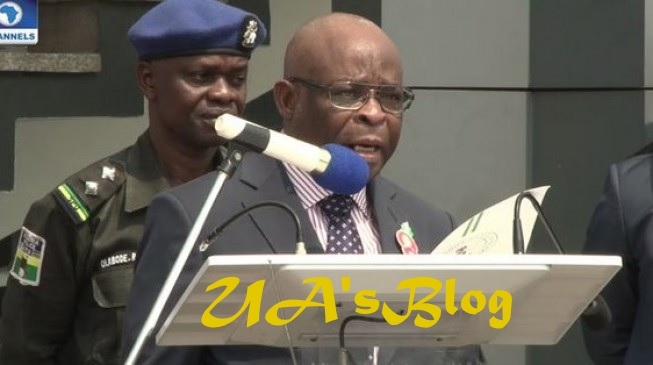 The court further issued an interim injunction that barred the tribunal from entertaining any application for Justice Onnoghen to step aside from his position as the CJN, until all the legal issues were resolved. The order came on a day the CCT panel slated to commence the trial. However, following the absence of the Defendant to take his plea, the tribunal, which insisted that it must proceed with the case, re-summoned Justice Onnoghen to appear before it on January 22. The CCT Chairman, Mr. Umar, contended that under the 1999 constitution, as amended, the NJC, shared coordinate jurisdiction with the tribunal, and therefore lacked the vires to issue a binding injunction against its proceeding. In a counter move, the NIC, a day before the tribunal’s return date, in a ruling that was delivered by Justice Sanusi Kado, re-activated all the interim orders that stopped further proceedings on the charge against Onnoghen. Following an ex-parte application that was brought by FG, the CCT, on January 23, ordered Justice Onnoghen to step aside as both the CJN and Chairman of the National Judicial Council, NJC. Based on the said ex-parte order, President Muhammadu Buhari, on January 25, suspended Onnoghen and swore in the next most senior Justice of the Supreme Court, Justice Tanko Muhammad, as the Acting CJN. Meanwhile, at the resumed sitting of the NIC on Thursday, the AGF, aside challenging the jurisdiction of the industrial court to meddle in the non assets declaration charge against the suspended CJN, equally applied for all the interlocutory injunctions to be set aside. The AGF also urged the NJC to hands-off the suit which he said was grossly incompetent. Other Defendants in the matter are the CCT Chairman, the Code of Conduct Bureau, the NJC, the Federal Judicial Service Commission, the Inspector-General of Police, and the Senate President, Dr. Bukola Saraki. All the defendants were absent at the resumed sitting, apart from the AGF who was represented by Mr. Dauda Lamiri. Mr. Lamiri told the court that all the parties were duly served with the AGF’s motion. Counsel to the Claimant, Mr. James Igwe, SAN, acknowledged that he had been served by the AGF, saying he was not aware why all the other defendants were not in court. Before he adjourned the case till March 14 for hearing of the substantive originating summon and all pending applications, Justice Kado directed that hearing notices should be served on all parties and proof of service kept in the case file. The Mr. Umar-led CCT panel had last Monday, adduced reasons why the suspended CJN must be arraigned to enter his plea to the six-count charge FG levelled against him. The tribunal maintained that it was legally wrong for Justice Onnoghen, to stay afar and query the competence of the charge, as well as jurisdiction of the CCT to entertain same. Mr. Umar relied on previous decisions of the Supreme Court and provisions of the Administration of Criminal Justice Act, ACJA, 2015, to contend that a Defendant in a criminal matter must firstly mount the dock and enter his plea to the charge, before any application could be heard. The panel therefore directed the suspended CJN who was absent for the third consecutive time, to appear before it next week Tuesday to be arraigned over the allegation that he failed to declare his assets as prescribed by the law, as well as, operated foreign bank accounts, in violation of the code of conduct for public office holders.